The current Burundi flag was adopted when the nation gained its independence from Belgium in the middle of the 20th century, but has a history that predates the colonial period. The flag of Burundi has changed more often than that of most other nations in Africa, but it has always retained a resemblance to the nation's historical flag. The national flag of Burundi was adopted on March 28, 1967. It consists of a white saltire which divides the field into alternating red and green areas. The center of the saltire merges into a white disk, on which there are three red solid six-pointed stars outlined in green. The ratio of the flag was 2:3 until September 27, 1982. Symbolism: The green colour symbolizes hope, the white symbolises peace, and red those who fell in the struggle for independence. The three stars stand for the three major ethnic groups of Burundi: the Hutu, the Twa and the Tutsi The three stars also stand for the three elements of the national motto: Unité, Travail, Progrès ("Unity, Work, Progress"), which can be seen on the Coat of arms of Burundi. 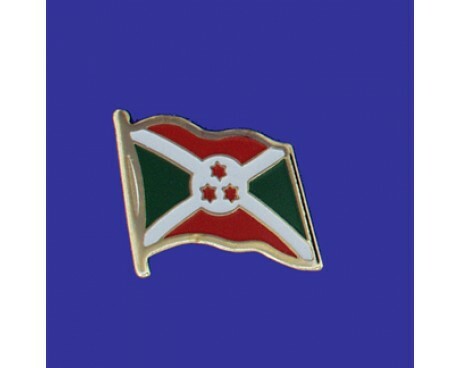 The Burundi flag is a white saltire that holds three red stars with green outlines and divides the flag's field into four equal sections. The top and bottom sections of the field are red, while the left and right sections of the field are green. 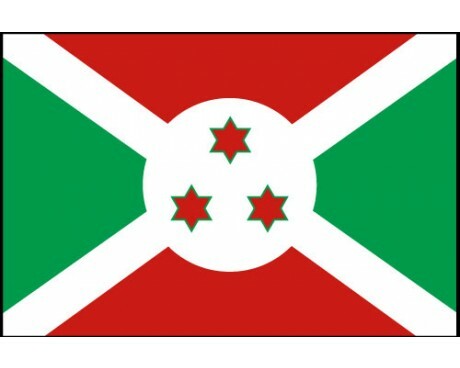 The white saltire represents peace, the green sections represent hope for the future, and the red sections represent the blood that the people of Burundi shed while they were fighting for their freedom. 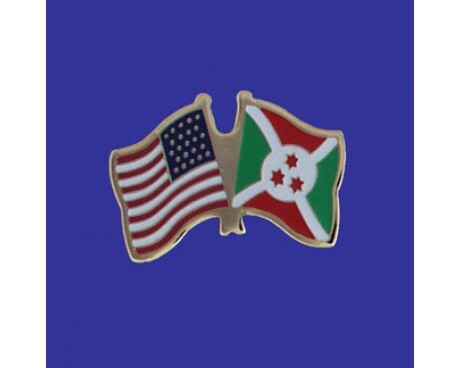 The three stars represent the three ethic groups that make up the majority of Burundi's population and the three parts of the national motto. The first known symbol of Burundi featured a depiction of the karyenda drum, which was believed to hold divine power in the nation's traditional religion. The drum was a symbol of royal power in Burundi, and it only remained on the flag while a monarchy held power over the nation. It was featured on the flags that predate Belgian rule over Burundi and on the first flag that the nation used after it gained its independence in 1962. That 1962 flag was identical to the modern flag except that it used the drum growing from a sorghum plant as its symbol instead of the modern stars. The flag of Burundi changed in 1966 when the monarchy lost powers. The emblem was removed from the flag to create a transition flag that was used for two days until a new flag could be created. The new flag featured a sorghum plant without the drum as its emblem. The plant was chosen to represent the country due to its traditional importance in the nation's agriculture. That flag was replaced by the modern flag in 1967 in order to use a design that better represented the nation's people. 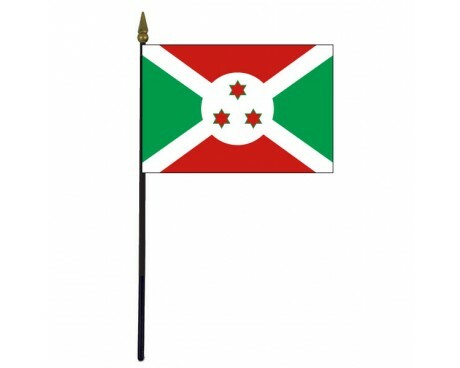 The flag of Burundi has not changed since then, and it remains popular with the Burundian people.